Quote: While other members of Congress are hosting gun-control advocates for Tuesday's State of the Union address, Rep. Steve Stockman has given one of his visitor's gallery tickets to Ted Nugent, the conservative gun-rights supporter. "I am excited to have a patriot like Ted Nugent joining me in the House Chamber to hear from President Obama," Mr. Stockman said in a statement announcing the choice. "After the address I'm sure Ted will have plenty to say." Haha, this oughta be good! Give 'em hell Ted! I hope he salutes our dear leader. Proud to be a member of pa2a.org since Oct 2012. RocketFoot;78037 Wrote: Haha, this oughta be good! Give 'em hell Ted! What's the HIGH/LOW guess as to how many SS agents will be around Ted?? worker987, proud to be a member of pa2a.org since Sep 2012. He ain't pretty but he's right. Nugent’s interview with Breitbart News came in Texas Republican Rep. Steve Stockman’s office on Tuesday afternoon, shortly before Obama’s State of the Union address. Nugent was Stockman’s guest at the speech. “I come from the streets,” Nugent said. “I’m a street fighting guy. If I want to make money, I got to get a great bunch of talented guys together and a crew of 12 guys or 15 guys that can get the job done of 200, or if the government was in charge 2,000. I have got to set my alarm clock. I have got to keep myself healthy so I can go on the road and rock my balls off 75 or 80 nights a year, so that I can take the hunting season off. Nugent said Republicans are too focused on being polite and looking pretty than on winning the fight. Nugent said Republicans don’t seem to have that street fighter mentality necessary to win. “It’s almost like Mr. Rogers with Lawrence Welk music,” he said. “That can’t win anything. The other side is ruthless. They’re just ruthless. They’ll do whatever they have to do. Improvise, adapt and overcome would serve us better." Nugent also detailed for Breitbart News several instances in which media has been biased against him. “Did you know there was a headline on the Houston Chronicle—it was a headline-after my concert many, many years ago when the real outrage over immigration and the illegal invasion was really building steam, particularly in Texas,” Nugent said. 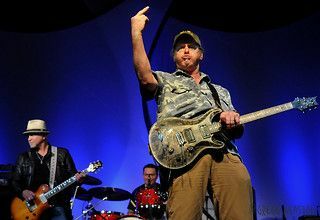 Another example of media bias Nugent cited is from when he once joked that he defecated in his pants to avoid the draft.